A commission for Nick Griffalco on AH.com based on this scenario. Essentially, the Russians are more Pacific-oriented with a better Pacific fleet early on, and go on to conquer parts of Qing China, more of the Americas, and take the Philippines from the Spanish in return for Californian coastline. While initially not an incredibly valuable trade, Russia has since built up its little empire of the Pacific, furnishing the Petrines with railways, schools, universities, hospitals, and more. 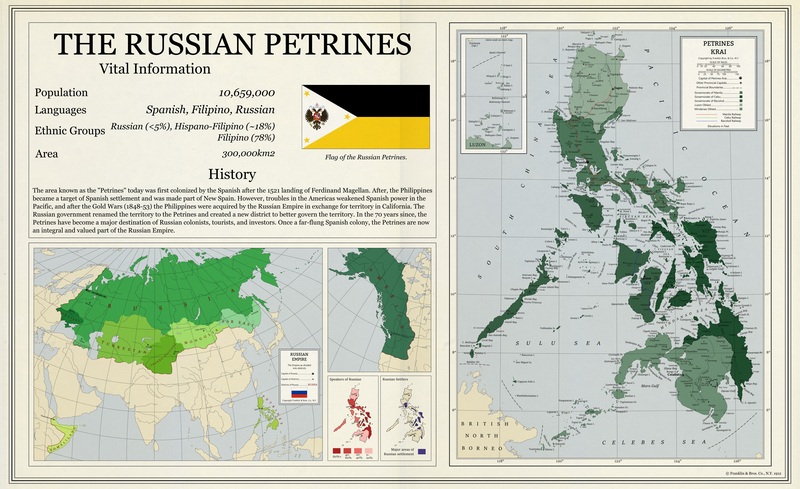 Unlike the Spanish, the Russians sought to integrate the Petrines directly into their territory, creating a Krai out of it and dividing said Krai into three governorates and two oblasts. Colonization comes from all over the Russian Empire, with Africans, European Russians, Ukrainians, Poles, Turks, Siberians, and Jews all settling in the Petrines and helping to make it truly part of Russia. Just about 70 years after acquiring it, a large amount of the population speaks Russian as a first or second language as both the wealth and population of the Petrines continues to grow. If you want a commission like this, feel free to contact me via Google Plus. If you want to support me and see more maps like this, consider donating to my Patreon.